The Oil Industry Safety Directorate is a Government of India body that operates under the Ministry of Petroleum & Natural Gas. It is the apex Indian body that sets safety standards and recommended practices that are to be followed in all oil and gas installations in India including offshore and onshore platforms, oil terminals, tank farms, refineries, pipelines and so on. 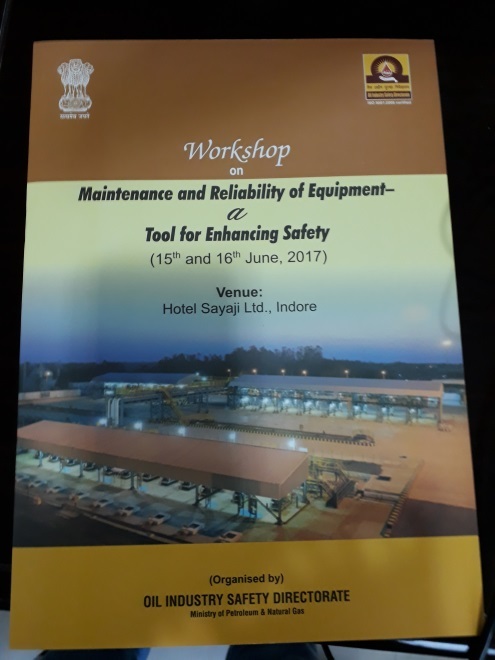 In June 2017, OISD organized a training workshop for senior and mid level managers and executives working in India’s oil & gas sector titled “Maintenance and Reliability of Equipment- A Tool for Enhancing Safety” at Indore. Risknowlogy was invited to talk on “Basic SIL & Functional Safety-Verification and Validation” according to IEC 61511 on 16th June 2017. Mr. Mandar Phadke, Director at Risknowlogy India, was the speaker. Risknowlogy has an extensive training course catalog on SIL and Functional Safety. Mr. Mandar Phadke’s talk saw enthusiastic response from the audience, consisting of senior and mid level executives from India’s leading Oil companies such as Indian Oil Corporation, Hindustan Petroleum, Bharat Petroleum and others. About 100 people had traveled from all over India to participate in this training workshop. On behalf of OISD, the Executive Director Mr. V. Janardana Rao, Director (MO) Mr. L.L. Sahu and Joint Director (MO)-POL Operations Mr. U. S. Roy graced the occasion. The participants were very happy with the talk and gave a very good feedback to Mr. Mandar Phadke in person as well as to OISD, which appreciated the contribution. “It was a wonderful session. Feedback received from delegates on your presentation was outstanding. Looking forward your association in future also.” – U S roy.